The following is a guide for instructors giving training to SPORT PILOT students. Though some items also apply to Private Pilot students, there are enough differences that those instructors should look elsewhere for guidance on giving the proper endorsements. I certify that [insert student’s name] has presented me a [insert type of document presented, such as a U.S. birth certificate or U.S. passport, and the relevant control or sequential number on the document, if any] establishing that [he or she] is a U.S. citizen or national in accordance with 49 CFR 1552.3(h). Everything you need to know is described in FAR Part 61, as well as AC 61-65E . You can think of the student pilot certificate as a permanent endorsement record. In fact, even though the student pilot certificate eventually expires, the endorsements on it never expire. Don’t believe me? Check AC 61-65E, paragraph 12 (b). Make sure your student keeps every student pilot certificate with endorsements – even if the certificate’s expired. Otherwise, you’ll need to re-issue those endorsements. What happens if another instructor issued the endorsements on the student pilot certificate? That’s not a problem – the FAA doesn’t care which instructor gave the endorsement. You don’t need to re-endorse a student pilot certificate when you take over a new student, or when the student’s certificate expires. A make and model endorsement in the logbook that’s valid for 90 days. So your student’s ready for his first solo flight and doesn’t have any endorsements. What do you need to do? First, you’ll need to provide training on the knowledge items in 61.87 (b). You’ll also need to provide (and log) flight training on each of the maneuvers and procedures listed in FAR 61.87 in the same, or similar, make and model as the solo aircraft. You’ll make sure that the student demonstrates satisfactory proficiency and safety in each of the maneuvers. Next, when you feel he/she is almost ready to solo, you’ll give the student a pre-solo written test and review all incorrect answers with the student. I certify that (First name, MI, Last name) has satisfactorily completed the presolo knowledge exam of FAR 61.87(b) for the (make and model aircraft). Once you’ve given and logged all of the required training in the student’s logbook, you can endorse the student’s pilot certificate. On the pilot certificate, you’ll record the date and make and model, then sign and enter your CFI certificate number and expiration date. Once given, this endorsement is good forever. That they’re proficient to make solo flights in the make and model. For the very first supervised solo flight, limit it to the date, airport, and aircraft. This protects everyone. I certify that (First name, MI, Last name) has received the required pre-solo training in a (make and model aircraft). I have determined he/she has demonstrated the proficiency of § 61.87 (c) and (d) and is proficient to make a supervised solo flight at (local airport) on (include date) in (make and model aircraft). I certify that (First name, MI, Last name) has received the required training of § 61.31 in a (make and model aircraft). I have determined him/her proficient to act as PIC of a tail wheel airplane . I certify that (First name, MI, Last name) has received the required pre-solo training in a (make and model aircraft). I have determined he/she has demonstrated the proficiency of § 61.87 (c) & (d) and is proficient to make a supervised solo flight on (include date) in (make and model aircraft) at (local airport) . After you are confident with the supervised solo flights, your student will be ready to have their leash get longer and take the airplane up when you’re not around. However, they need another logbook endorsement for unsupervised solo. The important thing here is that you are setting a time limit for how long the endorsement is valid. This can be any length of time from a few days up to 90 days. You cannot exceed 90 days. I certify that (First name, MI, Last name) has received the required training to qualify for local solo flying at (local airport). I have determined he/she meets the applicable requirements of § 61.87(n) (2) and is proficient to make solo flights in (make and model) until (maximum 90 days from date given). Note that airspace endorsements are required for each 90 day (or less) endorsements above and below. Before you give additional 90 day endorsements (or something shorter) you’ll need to give the student training on the maneuvers and procedures identified in FAR 61.87, and determine that they’re proficient in both the maneuvers and procedures and in the make and model. If you’ve taken over the student from another instructor, make sure you’ve evaluated each these maneuvers and procedures at some point and time. 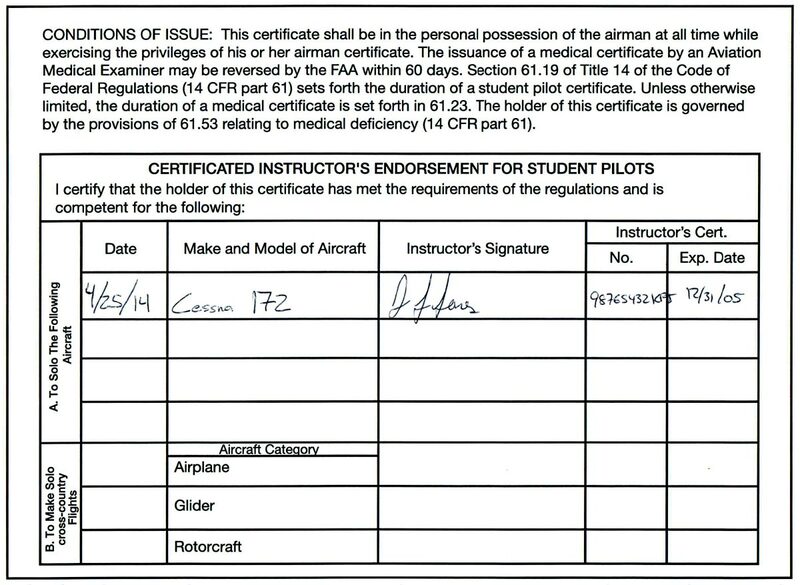 Before you endorse the logbook, check the student’s pilot certificate for the corresponding make and model endorsement. You can’t issue the logbook 90-day endorsement until the student’s pilot certificate has been endorsed for that make and model. If you can’t find it, you’ll need to re-endorse the student pilot certificate. You’ll need to verify that you’ve given all of the required ground and flight training required for the initial solo endorsement – including the pre-solo written exam. I certify that (First name, MI, Last name) has received the required training to qualify for solo flying. I have determined he/she meets the applicable requirements of § 61.87(p) and is proficient to make local solo flights at (local airport) in (make and model) until (maximum 90 days from date given). I certify that (First name, MI, Last name) has received the required solo cross-country training. I find he/she has met the applicable requirements of § 61.93, and is proficient to make solo cross-country flights in a (make and model aircraft). The FAA addresses limitations indirectly in the cross-country endorsements section of AC 61-65E, but they don’t cover them in the FARs. However, most instructors agree that adding limitations protects both you and your student. First, it may help limit some of your liability as an instructor – you probably don’t want your student taking the airplane up solo in 30kt gusting crosswinds. Remember, after your student’s endorsed, they don’t need to ask your permission to fly. I certify that (First name, MI, Last name) has received the required presolo training in a (make and model aircraft). I have determined he/she has demonstrated the proficiency of FAR 61.87(d) and is proficient to make solo flights in (make and model aircraft). If you need to increase the limits later, you’ll need to re-endorse your student’s logbook. I certify that (First name, MI, Last name) has received the required training of § 61.325. I have determined he/she is proficient to conduct operations in Class B, C, or D* airspace, at an airport located in Class B, C, or D* airspace, or to, from, through, or on an airport having an operational control tower. I certify that (First name, MI, Last name) has received the required training of § 61.327 in a (make and model aircraft). I have determined him/her proficient to act as PIC of a light-sport aircraft that has a VH greater than 87 knots CAS. I certify that (First name, MI, Last name) has received the required training of § 61.327 in a (make and model aircraft). I have determined him/her proficient to act as PIC of a light-sport aircraft that has a Vh less than 87 knots CAS.